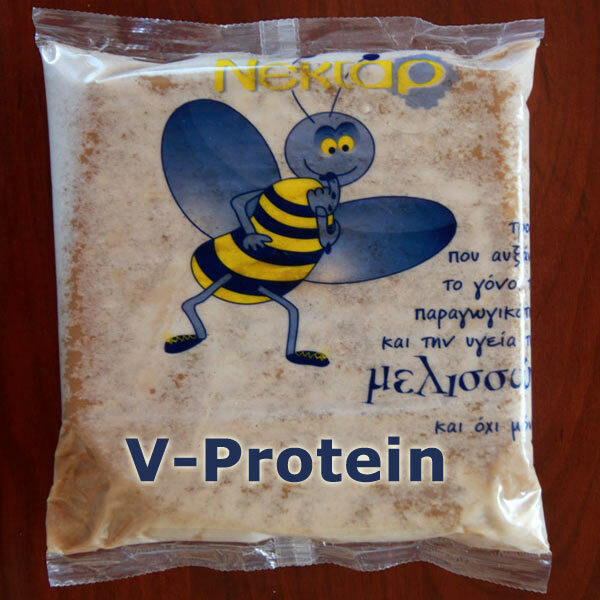 V-Protein (code 91614) is a complete and balanced bee food in the form of a pie (good pollen-pie with a good pollen substitute, rich in vitamins and trace elements). It preserves your hives and increases the population while curing varroa. This food, even if a small amount of pollen exists in the environment, after the first days creates satisfactory growth of the bee swarms, provided that the other conditions for the bee to give birth are met (such as nectar or stimulant supply etc.). With this food, you need to feed the bee swarms for 40 consecutive days to definitely have a very effective treatment of varroa, even better than any other pharmaceutical product, as expensive as it may be. Eight years of personal scientific experiments have shown that the effectiveness of V-Protein (code 91614) in the treatment of varroa is better than using medication (with or without toxic substances). it contains non toxic substance. No matter how strange and unbelievable the above may seem, a test in 10 of your hives will surely convince you (as long as the instructions are applied literally). This food costs only 1.11 € per kg without VAT, while a simple pollen-pie on the market, costs approximately 1.2 – 2.2 € per kilo without VAT. 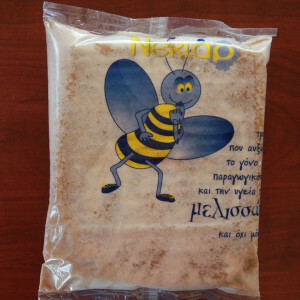 That is, by paying probably less you guarantee the health, certain and rapid growth of bee swarms, while simultaneously treat them for varroa (one of the most serious diseases of Greek beekeeping). A very simple food (not pollen-pie) costs approximately 1 €. To treat varroa, for example in a 10-frame beehive, if you use this food you will spend a total of 6-7 € (feeding for 40 days), while if you use medicine (approved or not) you will spend 6-12 € for approved and over 5€ for non-approved (with a chance to infect the hive and its products in the latter). Ultimately, this food is much cheaper, if you take into account that along with the treatment, it grows your bee hives at the same time, being a excellent quality pollen-pie. You should take into account as well that the use of medicine or other products, will add another 4-7 € for food and growth, and together with the treatment 9-17 €, instead of 6-7 € for a 10-frame beehive of our nutritional-therapeutic form. We recommend that you compare it with the rest of the pollen-pie products that are available on the market, observing simultaneously how many frames of population you possess at the end of the treatment. So, if you consider that every frame of bees costs 10 €, you will understand that this food is not only much more economical, but it also provides extra income, since the new and healthy population, will produce more honey or other products you collect from the bees. Placement of this food must be 1kg at a time and not all together (that is, once the swarm has consumed the first kilo, then we place the second and so on). Beware of the highly impaired bee swarms (that are not capable of consuming the desired amount of food we mentioned), it is best to boost them simultaneously with syrup and vitamins. The treatment is then considered to begin when they recover and start consuming the amounts stated above. From then on (usually 6-10 days later), the counting of 40 days for varroa treatment begins. After the end of the treatment, the bee swarm is kept clear of varroa for a longer period of time than any other treatment, because in addition to curing the disease, we have strengthened greatly the defense of the bees, due to its excellent ingredients in the right proportions. AND MORE PRODUCTIVE BEE SWARMS.